I teach about 20 pupils aged from 3 to 18 in Suzuki books 1 to 7 and working towards grade 8. Each pupil attends a weekly individual lesson (the very youngest come for two short lessons each week) as well as a fortnightly group lesson for five or six pupils of similar age and standard. Individual lessons vary in length between 15 and 60 minutes, depending on the age and stage of the child. Every lesson covers aspects of technique (exercises, studies, scales and arpeggios), sight-reading, polishing a concert piece, working on a new piece, and developing musicianship with an old repertoire piece. Very often we play duets together - or two pupils with adjacent lessons will play a piece together at two pianos. One or both parents of each pupil always attend lessons and make written notes (or sometimes video the lesson) to enable them to practise effectively with their child. The timetable encourages pupils to arrive early or stay on after their own lesson to observe another pupil who is slightly older and slightly more advanced. This has the added advantage that children in their lesson are used to playing in front of other people. 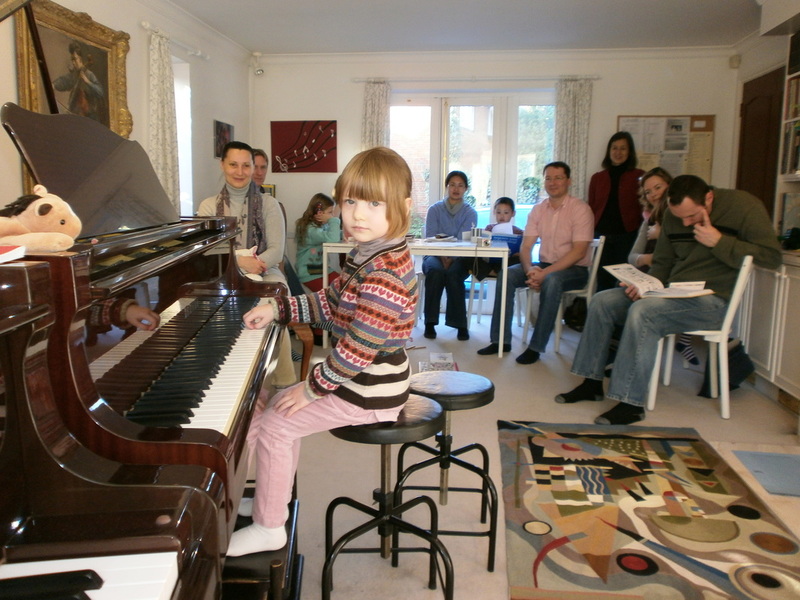 Group lessons, which we call Piano Club, can be noisy and fun, although with an underlying serious pupose. Games are used to develop pupils' concentration, their co-ordination, ear training, visual reading skills and performing skills. Many of the games are described fully in my Notebook for Suzuki Piano Teachers (removed by request). Others are given in my articles Ideas for Group Lessons and Music Club: Ideas for Group Teaching. ​Pupils are encouraged to listen extensively to recordings of the music they are learning as well as to other good classical music. I have myself recorded suitable teaching pieces and pass the CDs to my pupils as they become ready for them. Book recitals are presented by each pupil on completion of each book of the Suzuki repertoire. These are typically hosted in the pupil's home, and are followed by a celebratory tea with home-baked cakes! All my Suzuki families are invited, and they have all come to know each other well. I arrange termly concerts, either in my teaching studio or in a hired hall, sometimes with other music teachers, and always including a tea party (more home-baked cakes!). We hold a biennial Playathon. About once a year I arrange for a distinguished teacher to run a workshop or masterclass with my pupils. Teachers have included Andrew Ball, William Fong, Michael Young, Paul Harris, Penelope Roskell, Heli Ignatius-Fleet, Ilga Pitkevica, Jonathan Jones, Kevin Smith, Caroline Fraser, Kristinn Orn Kristinnson, Caroline Gowers, Kasia Borowiak, Sue Bird and Beate Toyka. Pupils participate regularly in national Suzuki events. Most of my recent pupils hold music scholarships at their local schools and/or have passed grade 8 with distinction. Several pupils are now studying at the Royal College of Music Junior Department and Guildhall School of Music Junior Department. Other pupils have gone on to study at the Purcell School, at Oxford and Cambridge, and as an undergraduate at the Royal College of Music. I rarely have vacancies and, other than in exceptional circumstances, I start pupils only under the age of five. For a list of trained Suzuki teachers look on the British Suzuki Institute website. I run an ESA teacher training course in my studio in Cambridge. See the teacher training page of my website for further details. Observers are always welcome in my studio - teachers have come from all over the UK as well as Italy, Spain, Norway, France, Belgium, the Czech Republic, Latvia, America and Australia. For those with an interest in the Suzuki approach, I recommend perusing the well-argued article by Elise Winters on What Suzuki knew that took science 50 years to prove.